If a wine geek had carte blanche to create the restaurant of his dreams, he’d save himself a lot of time by simply replicating Pearl & Ash in New York City. It’s been nearly a week since I dined there, and thinking back to that evening still makes me giddy. Last Thursday, I headed up to New York City to join fellow Terroirist Rebecca Canan and the graduating wine team at Columbia Business School to dine with Jean-Louis Carbonnier of Chateau Palmer at Le Périgord. Once that dinner was on the books, I decided to extend my trip so I could check out Pearl & Ash on Friday evening. 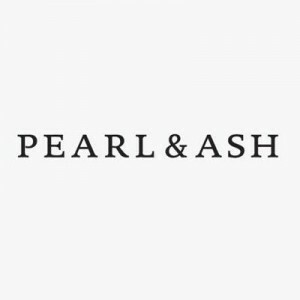 Or check out Levi Dalton’s interview with Pearl & Ash wine director Patrick Cappiello. Or check out Patrick Cappiello’s Instagram feed, which is typically packed with photos of silly wines. Or just look at the wine list. Although Prévost has a cult following among Champagne obsessives, I’d never tasted his wines before. Prévost owns five acres of Pinot Meunier in the village of Gueux, which lies on the edge of the Mountain de Reims. From this tiny parcel, he produces one wine each year — and disgorges the wine 18 months after bottling and finishes it without any dosage. Prévost’s current release is from 2010, and if you can find it, his wine will easily set you back $110. 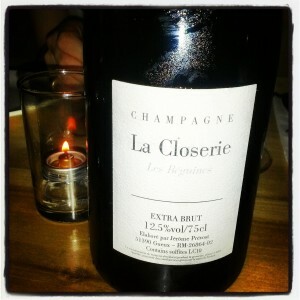 At Pearl & Ash, it’s on the list for an eminently reasonable $145. In a word, it was delicious. Whereas Jérôme Prévost is the darling of Champagne geeks everywhere, those who obsess about natural wine are in love with Hervé Souhaut. He eschews any intervention aside from a small amount of sulfur and works with 12 acres of vines — all between 50 and 100 years old — on the right bank of the Rhône Valley, just outside Hermitage. The most exciting wine he produces is “La Souteronne,” which is 100% Gamay. The nose is absolutely intoxicating, full of ripe, buoyant Gamay fruit backed by savory minerality. 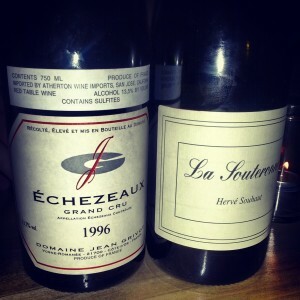 After the Gamay, we decided to splurge and order Jean Grivot’s 1996 Échezeaux. This wine needs no introduction. Échezeaux, of course, is both a Burgundy AOC and a Grand Cru vineyard. And Domaine Jean Grivot is widely regarded as one of the top producers in Burgundy. Patrick assured us that the wine was open for business, and it delivered. It was an extraordinary experience. So much depth, so much elegance, silky, and just plain yummy. The price? $300. This wine literally can’t be found at a single U.S. retailer. If you visit Hong Kong, though, you can find it for $334. At this point, the meal was over, so we headed to the bar for one more bottle. We were itching for some Bordeaux so asked Patrick for advice. 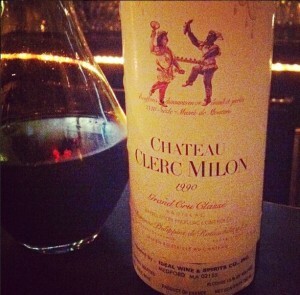 He suggested the 1990 Château Clerc Milon, on the list for $180. A 23-year-old, perfectly cellared Bordeaux for less than $200 seemed like quite a deal, so we went for it. Especially because Patrick assured us that the wine was singing. It, too, delivered. While the nose was initially obscured by brettanomyces (manifesting as dirty socks), it quickly opened up and offered all the delicious, sultry notes that can only be found in aged Bordeaux. As we prepared to leave, Patrick came to the bar with a parting gift — a glass of 1976 Château Coutet (Barsac). Just like the rest of the evening, the wine was amazing. It’d be a disservice to Pearl & Ash — and Richard Kuo, the restaurant’s chef — to overlook the food. From the pork meatballs and the octopus to the skate, quail, and lamb belly, all the dishes our table enjoyed were complex, balanced, and absolutely fantastic. As if the tweets weren’t enough. So jealous. I wanna go. I’m gonna have to make a pilgrimage.